Few lizards live long lives without incurring injuries, evidenced by the many wild-caught adults who display scars and missing appendages. By virtue of their periodic shedding process, lizards are able to discard wounded skin and replace it with fresh, new skin. While all lizards are able to repair superficial wounds, and some species can regenerate a lost tail, no lizards have the ability to regenerate digits or limbs. Lizards heal themselves from a variety of minor issues simply by shedding their skin. When a lizard sheds his skin, the creature sloughs off the outermost layer of skin, generally in a few large pieces. What is left is a completely clean lizard -- any dirt on the lizard fell off with the old skin -- with fresh skin on the surface. Wounds that penetrated more than the outermost layer of skin require multiple shed cycles to disappear completely. While preparing to shed, a lubricating layer of fluid builds up under the outermost layer of skin; dehydration impedes the production of this fluid, which can result in your lizard experiencing a bad, patchy shed. It is imperative to ensure that your lizard is well-hydrated when entering a shedding cycle. Lizards may cut or rip their skin in a number of ways. Encounters with predators or prey may leave a lizard with lacerations. Some lizards live in thorny or sharp habitats and get cut accordingly; others may receive cuts from breeding or territorial activity. If grasped by a predator, some geckos -- particularly many day geckos (Phelsuma sp.) -- will quickly twist and rip their skin off. This drastic technique allows the lizard to slip from a predator's grasp, leaving the predator holding a pile of skin. Most superficial cuts heal with few complications, through a combination of blood clotting and regenerated skin replaced at regular intervals. It is important that an injured lizard has access to suitable basking opportunities; to prevent an open wound from becoming infected, the lizard must keep his body temperature at its optimal rate to ensure a robust response from his immune system. Lizards with long life spans, such as monitors (Varanus sp.) 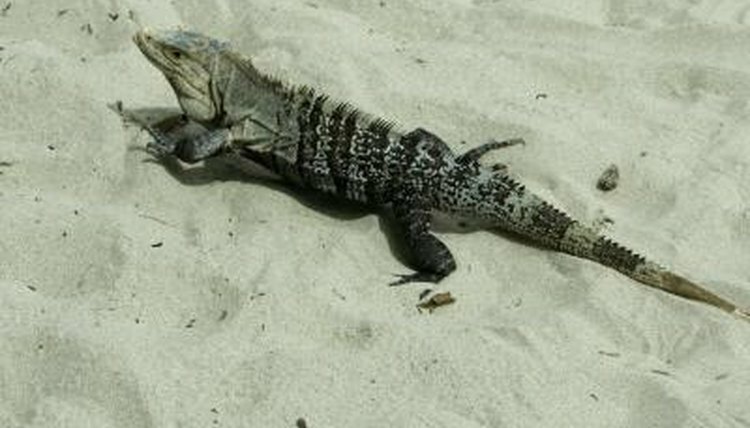 and green iguanas (Iguana iguana) commonly lose digits over the course of their lives. Predators, conspecific fights and parasites are common causes for the loss of a digit; fortunately, such injuries usually heal and cause the lizard few or no long-term problems. If a lizard retains shed skin around his toes, circulation may be impaired, causing the eventual loss of digits. This is most common in captive lizards who experience shedding difficulties because of improper husbandry. While most lizards can adequately cope with the loss of a digit, a lizard who loses an entire limb is likely to succumb to blood loss or infection. Many lizards exhibit a behavior known as caudal autonomy, meaning that the lizard may voluntarily break off his tail. Executed in response to predators, this behavior allows the lizard to escape while his still-twitching tail distracts the would-be predator. The tail typically breaks along special portions of tail vertebrae termed fracture planes. A break at a fracture plane is usually relatively clean; therefore, the skin does not have to grow around a ragged, bony edge. Following the separation of the tail, the wound soon clots and the skin around the wound closes in a matter of hours or days. Sometimes, but not always, the lizard will partially regenerate his tail. The regenerated tail often differs in appearance from the original. Species with prehensile tails typically protect them from predators and are not capable of caudal autonomy. Can an Anole Live With a Long Tailed Lizard? Why Do Lizards Go Under Dirt? How Do Lizards Survive Danger? What Allows Lizards to Regrow Their Tails? Can Bearded Dragons Get Hiccups?